Almonds are another fan favourite due to their sweeter taste, admirable versatility & their powerhouse nutritional content. These nuts make an easy addition to the healthy or striving-to-be-healthy diet. Almonds are widely recognised for their nutritional content and health benefits. Many consider them to be a brain food, and they can be said to assist in lowering cholesterol and stabilising blood sugar. Almonds may also assist in maintaining healthy weight. In moderation, consumption of these guys can support a healthy heart. The use of almonds in only limited by your imagination. They can be eaten raw, toasted & activated. They're quite the chameleon as they can be found whole, slivered, flaked, blanched, ground and even as a milk. But we quite like them as a spread on our toast. Add them to your salads, stir fry, smoothies, muesli, eggs & especially in your baking. Better yet, try this simple little recipe and add it to your snack team. 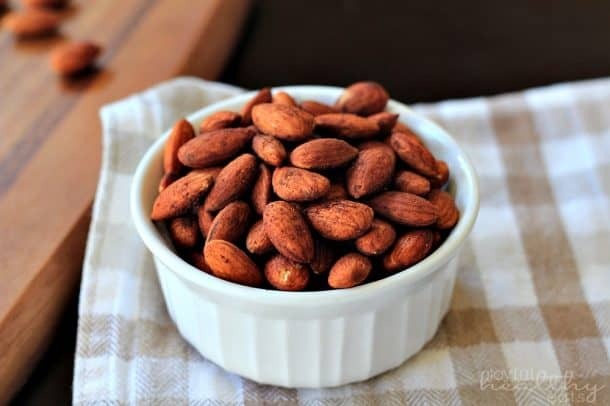 In a large bowl, add almonds, cinnamon, salt, and coconut oil. Roast for 1 hour, remove from oven and serve immediately or store in air tight container.